Parker was born Bronx, New York City. He was not formally trained as a classical player, though he did study with Jimmy Garrison, Richard Davis, and Wilbur Ware and learned the tradition. Parker is one of few jazz bassists who regularly plays arco. He also plays several other instruments from around the world, including the West African kora. While Parker has been active since the early 1970s; he has had a higher public profile since the early 1990s. He is a prominent and influential musician in the New York Cityexperimental jazz scene, and has regularly appeared at music festivals around the world, including the Guelph Jazz Festival, in southern Ontario. Parker first came to public attention with pianist Cecil Taylor. He has long been a member of saxophonist David S. Ware's quartet and in Peter Brötzmann' s groups. He is a member of the cooperative Other Dimensions In Music. Together with his wife organizes the annual Vision Festival in New York City. 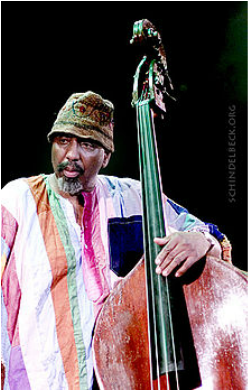 The album Sound Unity by the William Parker Quartet was chosen as one of Amazon.com's Top 100 Editor's Picks of 2005. His August 2008 CD Double Sunrise over Neptune was listed as one of the top 10 2008 (through end of August) Jazz CD's at Amazon. Also released in 2008, Petit Oiseau was chosen as one of the best jazz disks of 2008 by The Wall Street Journal, the BBC's Radio Three, The Village Voice, and PopMatters.